Trouble viewing or hearing sound? Download 50mb video in one minute here to play on your machine, or read the interview transcript below. Now – it is a flagship programme at the heart of the Government’s welfare reforms, but it has also been extremely controversial and this morning the Universal Credit scheme came under fresh criticism from the National Audit Office. The watchdog said that it found evidence of weak management and poor governance. The Work and Pensions Secretary Iain Duncan Smith had to come to the Commons to answer an ‘Urgent Question’ from Labour on the issue. Well, with me now is Brian Wernham, a Fellow of the Association for Project Management and author of ‘Agile Project Management for Government’. Welcome! It doesn’t appear that the project management here has been particularly ‘agile’. Well, the Department for Work and Pensions (DWP) started out to produce a system that is intensely complicated, and they’ve spent three years designing, developing… leaving the testing until the last moment before it went live. So therefore I would say that this is a ‘big bang’ project – a classic ‘waterfall’ project, if you like, where they spent a lot of time designing, building, testing, but without the piloting and phasing in that you would expect from an Agile project. 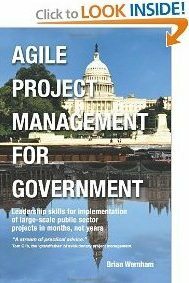 Lots of other Government departments and Agencies have produced good results using an Agile Government approach. What the DWP has done is a ‘big bang’ project, and it looks as though there will have to be quite a lot of rework. Now, you said “Not enough piloting”. Is that the main reason for things going wrong in your opinion, or should there have been even better testing of the computer software before even getting to the piloting stage? Over £30m has already been written off, effectively. Do you think that it is going to be the cause of more money being wasted? So just elaborate on that for us… £425m has to be accounted for? So you are saying that it could be more than £30m that could be written off? And it could be more? And just a final thought: Obviously there have been technology glitches and software problems with other Government projects – you know: that’s well catalogued… Are you surprised that it hasn’t gone completely smoothly on this occasion with such a big project – a flagship project for the Government? The problem is that it was made into a big project rather than being phased in. Maybe taking a few benefits at a time rather than all 6 at the same time across HMRC, DWP, Local Authorities with Housing Benefit – it is fiendishly complicated having to calculate these monthly Universal Credit statements that have to be sent to every claimant. If this had been (rolled) out in a more incremental, agile fashion, and if there had been better project management capability within the DWP – because fully 20 pages out of the 60 pages in the NAO report are all about project management capacity within the DWP. There were 5 project leaders within one year I noticed. Well, some very interesting thoughts there – Brian Wernham, Fellow of the Association for Project Management, thank you! Brian Wernham: Thank you Annita! « The US is shutting down… Or is it?